Two takes on a theme. One involving FM, the other AM techniques. My Basic Electricity #2 epilogue. This first patch was inspired by Richard & Rastko's jam on Friday night. It features the FM and Low Pass Gate action of the former and the lo-fi Ciat-Lonbarde sound of the latter. I recorded two passes of a Wogglebug & Maths driving Plan B's models 15 & 13 and Doepfer's A-112 sampler delay. This second patch has a similar core, but the sound is based on amplitude modulation. The dual peak sine of a Cwejman MMF-1 modulates a VCA-2P. The carrier was the sine of an A-143-9. I altered the C:M relationship throughout the patch. Delay was courtesy of the EHX SMMH. 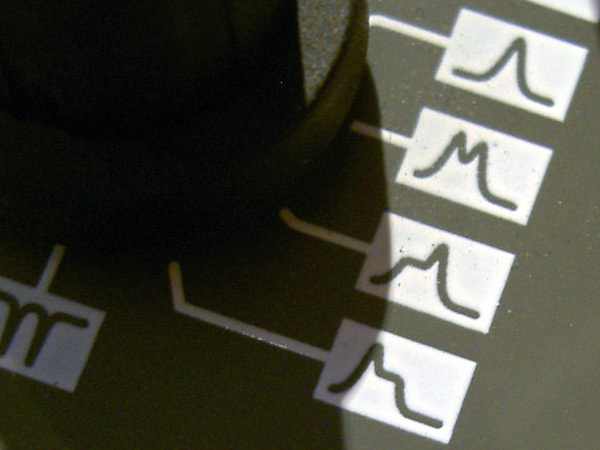 These patches show the types of complex timbres that can be achieved with modulation. With the current trend for 'West Coast' synthesis, FM is a familiar technique. AM seems to be regarded as ring modulation's poor cousin, but it can be a rich source of sounds. For me, part of its strength lies in the fact that the carrier, effectively the fundamental, is still present in the resulting signal. To get the most from AM, you'll need two VCAs and possibly some form of offset/ attenuation. As ever, Gordon Reid has the dope. Thanks to everyone who came to the gig and to Rastko, Hayden & Richard for the wonderful performances. Heads up! 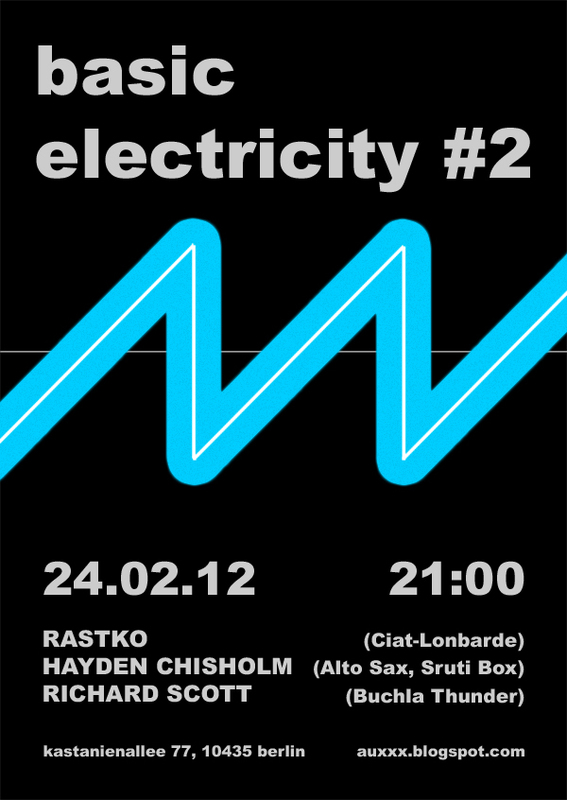 Basic Electricity #2 with live performances from Rastko, Hayden Chisholm and Richard Scott is this Friday! Full details are here. Here's a short clip of the trumpet being played into the CocoQuantus: "Ich bin mit meiner Trompete zu bringen und ich werde es blasen!" Straggle from richard scott on Vimeo. Don't forget: this Friday, February 24th at 21:00. Kastanienallee 77, 10435 Berlin-Prenzlauer Berg. Looking forward to seeing you! Using a min/max analogue logic module as a phase comparator. Inspired by dougcl's classic PLL patches (1, 2) and this post by Giftnudel. PLLs seem to be a hot topic again. The jury is still out on whether they're used in the Buchla 259. Make Noise and WMD have announced PLL-equipped VCOs. They form part of the Wogglebug's chaotic heart and can be heard sputtering in the Hertz Donut's bad tracking modes. 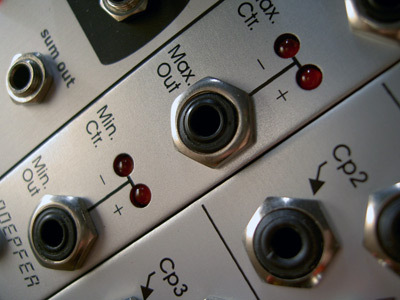 Two VCOs are compared in a min/max module like the Doepfer A-172. The minimum signal is subtracted from the maximum and the difference fed back to the 'slave' via a slew limiter, thus generating a CV. Depending on the initial frequency difference between the two VCOs and the lag time, you can imitate the wonderful glitches made famous by dougcl. One nice thing about using this method over traditional sync is that it doesn't affect the sound of the slave as much. The other is that the slew limiter offers control over how well, or poorly, the oscillator tracks. 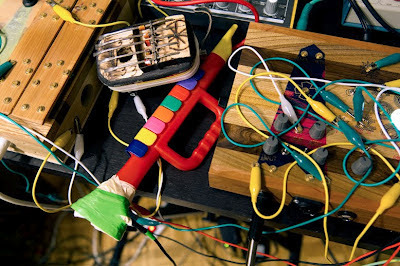 Live electronic/ acoustic gig in Berlin, featuring Rastko on Ciat-Lonbarde instruments, Hayden Chisholm on alto sax and Sruti box & Richard Scott on Buchla Thunder. Auxxx is proud to present an all-star line-up for the second Basic Electricity night. It takes place on February 24th at 21:00. The venue is the small cinema on Kastanienallee 77, 10435 Berlin-Prenzlauer Berg. 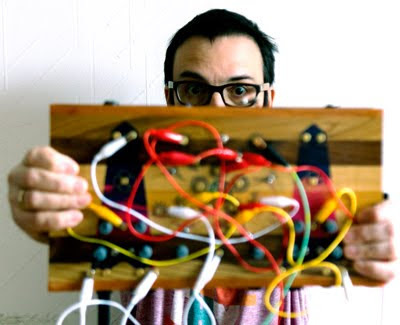 Rastko is a composer and improviser of electronic music based in Geneva, Switzerland. 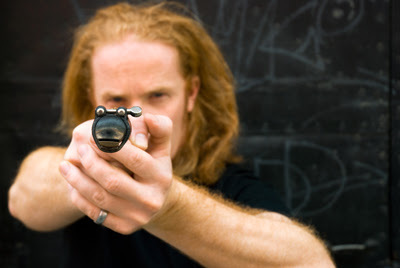 He has been composing music for contemporary dance, theatre and television since 1996. At BE#2 he'll be showcasing the unique Ciat-Lonbarde instruments. A video of him playing the Serge with the CocoQuantus can be found here. Hayden Chisholm is a New Zealand saxophonist and composer who has been at the forefront of European music scene for over a decade with his groundbreaking microtonal work and unmistakable sound. At BE#2 he'll be improvising a raga with his 'Well Tempered Sruti Box'. Here is a video of it in action. Our very own Richard Scott needs little introduction. 'Mr. 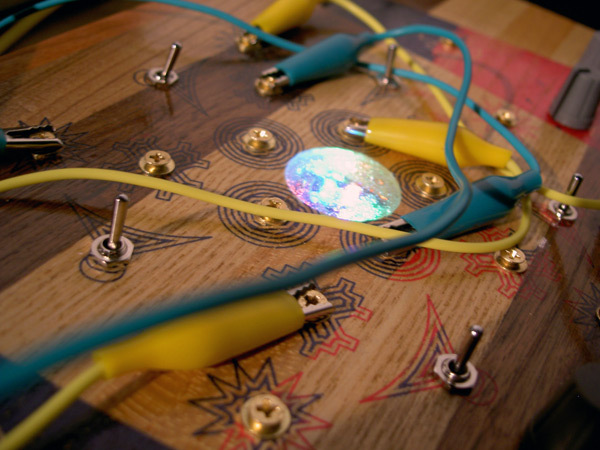 Wizard-Stix' will be wearing his magic wooly hat, casting sonic spells with his Buchla Thunder/ Wireless Gestural Instrument. You can find some of his recent videos here. The artists will play a solo and a collaboration. Basic Electricity #2 promises to be a very exciting night, mixing hands-on circuit manipulation, acoustic improvisation and gestural composition. We look forward to seeing you there!